I still have many Top 10 lists just waiting to be published and here is another that I was reminded of during my recently published interview with Gy Waldron, the creator of The Dukes of Hazzard which featured one of the coolest cars in history, "General Lee". 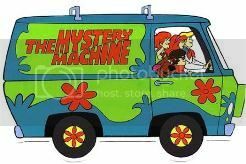 Honorable Mention #1: The Mystery Machine from Scooby-Doo - Though originating back in 1969 on Scooby-Doo, Where Are You!, new shows and many re-runs were still being shown regularly on Saturday mornings and after-school during the 80s. Despite being a cartoon and not being strictly 80s, I felt it still deserved at least an honorable mention. 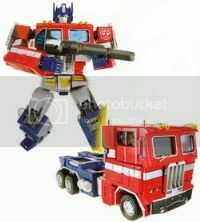 Honorable Mention #2: Optimus Prime from The Transformers (1984-1987) - Also an animated cartoon, the leader of the Autobots is actually a robot that transforms into a semi-truck. He is a true icon of the decade and there was at least a couple years where there wasn't anything more popular than The Transformers, so I debated including him near the top of the list and settled on at least an honorable mention. 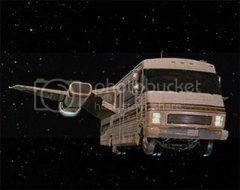 Honorable Mention #3: Lone Starr's "Eagle 5" Winnebago RV from Spaceballs (1987) -It is sort of a tribute to the Millennium Falcon, but part of the humor is that it is a RV and even has a bumper sticker that reads, "I love Uranus". This is really more of a spaceship than car, but since it is made out of a Winnebago I thought it certainly deserved at least an honorable mention. 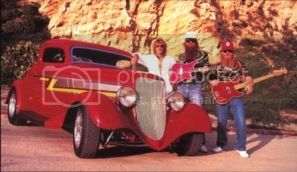 Honorable Mention #4: ZZ Top's "Eliminator" 1933 Ford coupe - The car appears on the cover of the band's 1983 album Eliminator. It was also featured in several music videos from the album including "Legs", "Gimme All Your Lovin'" and "Sharp Dressed Man" so it was on TV even though it wasn't necessarily on a TV series. I saw the car when I visited the Rock and Roll Hall of Fame last year and I felt it at least deserved honorable mention. 30. 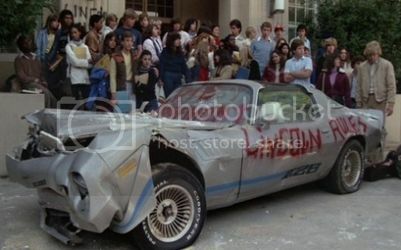 Jefferson's Chevy Camaro Z28 from Fast Times at Ridgemont High (1982) - Charles Jefferson (played by Forrest Whitaker) is the star football player. Spicoli and Jefferson's little brother take the car out and wreck it. After that, there is an exchange that takes place which I have always found to be hilarious ending with Spicoli saying, "Relax, all right? My old man is a television repairman, he's got this ultimate set of tools. I can fix it." They come up with the idea of making it look like the car was damaged by rival Lincoln High motivating Ridgemont to win the big game. 29. 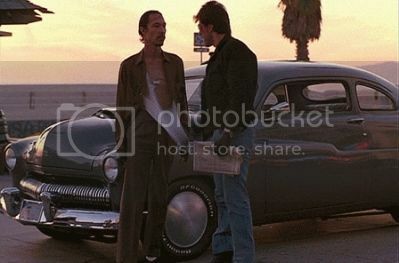 Cobretti's 1950 Mercury Monterey coupe from Cobra (1986) - Sylvester Stallone drives this matte grey coupe as an intimidating member of the "Zombie Squad" and vigilante cop who only follows his own rules. 28. 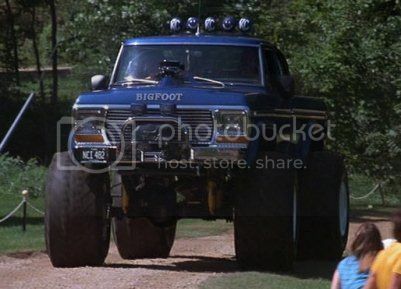 "Bigfoot" Ford F-250 pick-up from Take This Job and Shove It (1981) - A couple monster trucks were featured in this film including the original and most recognized of the group which was growing quickly in popularity at that time. The tires alone stand 66 inches tall! I remember in the early years of ESPN that they often filled programming slots with monster truck races. 27. Stiles' "Wolfmobile" from Teen Wolf (1985) - After Michael J. Fox starts turning into a werewolf, his buddy Stiles capitalizes on his fame by selling merchandise and even re-branded his van to the "Wolfmobile". He even drives around town with the wolf demonstrating some extremely dangerous van surfing (which should never be tried at home). 26. 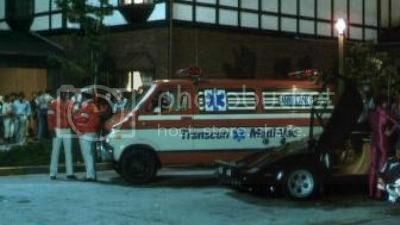 Transcon Medi-vac Ambulance from The Cannonball Run (1981) - This is the vehicle that Burt Reynolds and Dom DeLuise drive on this cross-country race. It is also worth mentioning the Lamborghini Countach driven by Adrienne Barbeau, the red Ferrari 308 GTS driven by Dean Martin and Sammy Davis as well as the Aston Martin driven by Roger Moore. 25. 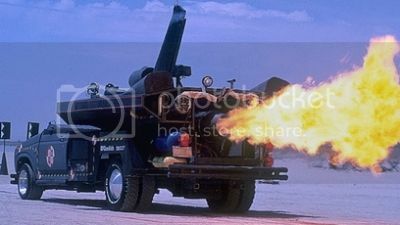 The Jet Car from The Adventures of Buckaroo Banzai Across the 8th Dimension (1984) - This modified Ford F-350 pickup truck is powered by a jet engine and is capable of exceeding Mach 1. The car is also equipped with a secret device called an "oscillation overthruster" which allows it to drive through solid matter even a mountain. Flames and smoke can shoot 20-30 feet behind the vehicle. 24. 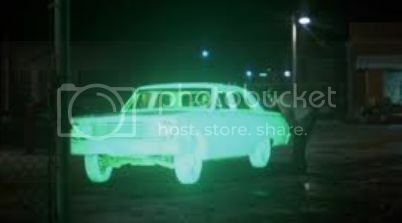 1964 Chevy Malibu from Repo Man (1984) - Emilio Estevez is on the hunt for this car which literally glows green in the dark because it contains four radiation-emitting space aliens in its trunk. 23. Happy Toyz semi-truck with Green Goblin face from Maximum Overdrive (1986) - Emilio Estevez (again) saves everybody in this film written and directed by Stephen King about a machine revolt. Machines, including trucks, come alive in an effort to torment and kill all of the humans. My favorite parts are the AC/DC soundtrack and the giant Green Goblin face that is mounted on the grill of the Happy Toyz truck. 22. 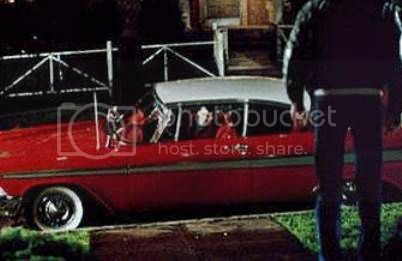 "Christine" the 1958 Plymouth Fury from Christine (1983) - Another film based on a Stephen King novel featuring a vehicle taking on a life of its own. Keith Gordon purchases and restores the old 1958 model which mysteriously begins to have an effect on his attitude and even appearance and then proves to be sinister evil when it later kills a couple other people. The car is eventually destroyed before it can do any more harm. 21. (tie) Jack Cates' 1964 Cadillac DeVille convertible from 48 Hrs. (1982) & Axel Foley's crappy blue 1972 Chevy Nova from Beverly Hills Cop (1984) - Not your normal police detective's choice of transportation. 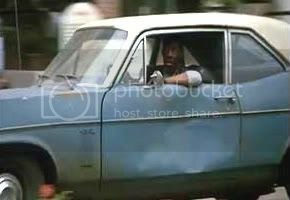 In 48 Hrs., Nick Nolte and Eddie Murphy spend quite a bit of time in this light blue classic until it ends up crashed ironically through the window of a Cadillac showroom. Though it might not stand out so much back in Detroit, Axel Foley looks even more out of place driving his car into ritzy Beverly Hills. Both cars tell you a lot about their owner and help with character development without saying a word. 20. (tie) Ferraris from Miami Vice (1984-1989) & Magnum, P.I. (1980-1988) - Everything that Sonny Crockett (Don Johnson) did on the show was trend-setting and considered cool with his cars certainly not an exception. For the first two seasons, he drove a black Ferrari Daytona and during season three he switched to a white Ferrari Testarossa. 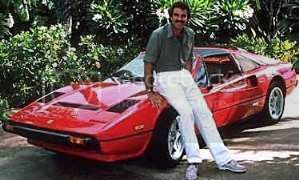 One of the many luxuries that Tom Selleck enjoys while doing his investigation work in Hawaii is the use of a red Ferrari 308 GTS. It's a pretty sweet gig, if you can get it. 19. 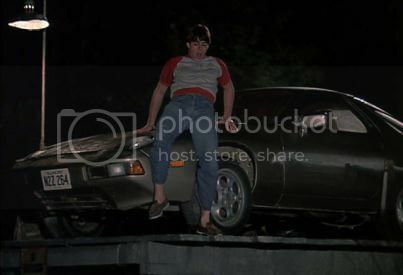 Joel's Dad's Porsche 928 from Risky Business (1983) - When Tom Cruise is left home alone, he is told not to touch the stereo or his dad's Porsche. He breaks the first rule when he dances around in his underwear to Bob Seger's "Old Time Rock and Roll". He then breaks the second rule when he proceeds to take the Porsche out for a spin. Later we helplessly watch the car take a swim in Lake Michigan when it rolls out onto a pier and the pier collapses. Joel is forced to throw a party to pay for the damages and he ends up learning the lesson that sometimes you just have to say, "What the f#*k". 18. 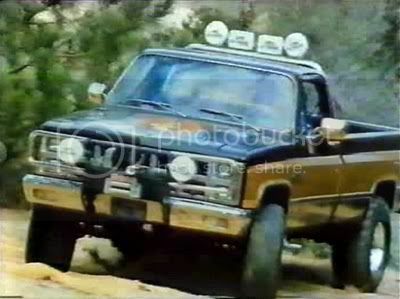 Colt Seavers' GMC Sierra pick-up from The Fall Guy (1981-1986) - I always liked this show and truck as a kid. The truck featured a big chrome roll bar with off-road lights mounted on it. There was a big eagle on the hood and a secret compartment in the bed. And looked even better when Heather Thomas was in or anywhere near it. 17. 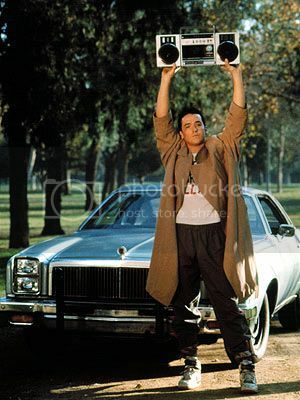 Lloyd Dobler's blue 1976 Chevy Malibu from Say Anything... (1989) - He makes this car seem cool. Lloyd and Diane get intimate in the car and it is also the scene of their emotional breakup. After he tells the guys where she dumped him one says, "Oh man, your car? Man, Dissed in the Malibu. That's your castle, man." Then he is standing in front of it during the triumphant and iconic scene later when he is holding the boombox above his head. 16. 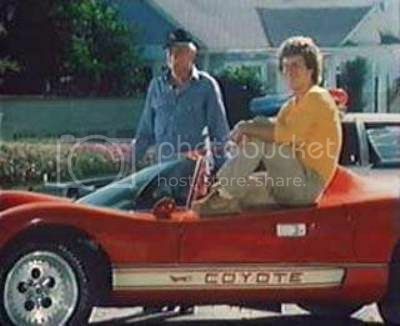 "Coyote X" from Hardcastle and McCormick (1983-1986) - Daniel Hugh Kelly is a car thief who gets busted, but let out by the judge in order to help him with some vigilante justice and the best part is that he is allowed to keep the awesome car he stole. 15. 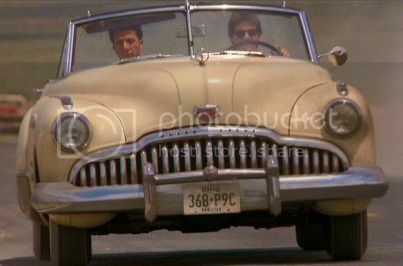 1949 Buick Roadmaster convertible from Rain Man (1988) - Charlie Babbitt (played by Tom Cruise) feels jilted when his father passes and all he inherits is this classic car and some prize rose bushes. He ultimately takes it on a priceless cross-country road trip with his brother (played brilliantly by Dustin Hoffman) who reveals many things including that "Dad lets me drive slow on the driveway every Saturday" and "I'm an excellent driver". 14. Chrysler Town and Country modified to be a Dodge 600 from Planes, Trains and Automobiles (1987) - This is one of my all-time favorite movies and this "rental car" appears in several great scenes including when they are driving the wrong way on the highway, when the car is burnt up from a discarded cigarette or when they crash through the side of a motel to name a few. It is confirmed to be a Chrysler Town and Country, but it was custom painted including the woodgrain sides and had a D hood ornament and the owner's manual for a Dodge 600 in the glove compartment. 13. 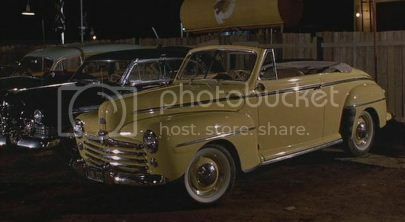 Yellow 1948 Ford Super DeLuxe from The Karate Kid (1984) - Daniel-san begins his karate lessons by washing and waxing several of Mr. Miyagi's cars including this one with the iconic "Wax on, wax off" mantra. Then he receives it as a birthday gift and goes to show it off to Ali at Golf N Stuff while the song "Young Hearts" played. One of the producers gave this car to Ralph Macchio after filming was completed. 12. EM-50 Urban Assault Vehicle from Stripes (1981) - Bored by just guarding this top secret weapon, Bill Murray and Harold Ramis decide nobody would notice if they borrowed it to go pick up their girlfriends in West Germany. It looks like a normal motor home or RV, but can quickly deploy bullet-proof armor as well as missile launchers, machine guns and even a flame thrower. 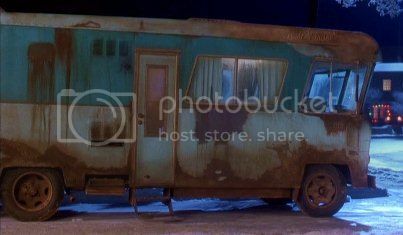 Eddie: Oh, that uh, that there's an RV. Yeah, yeah, I borrowed it off a buddy of mine. He took my house, I took the RV. It's a good looking vehicle, ain't it? Eddie: Yeah, it sure does. But, don't you go falling in love with it now, because, we're taking it with us when we leave here next month. 9. The A-Team's GMC Van from The A-Team (1983-1987) - There aren't many guys who grew up in the 80s that didn't love The A-Team. 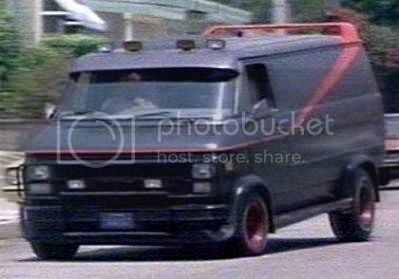 The iconic van was black and metallic gray with the red stripe, red mag wheels and rooftop spoiler. And it was driven by B.A. Baracus (Mr. T), so it didn't get much cooler than that. 8. "Ecto-1" from Ghostbusters (1984) - It was a 1959 Cadillac Miller-Meteor ambulance converted by Universal Studios to become the iconic ghost busting vehicle. 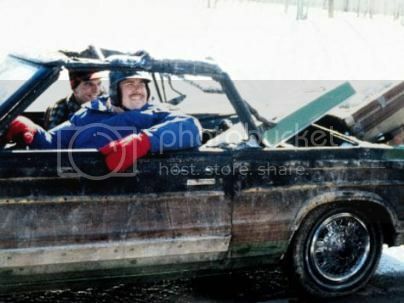 Dan Aykroyd's Ray Stantz character paid $4800 for it (which was a lot especially back then for a car in such disrepair) excitedly telling everybody, "Everybody can relax, I found the car. Needs some suspension work and shocks. Brakes, brake pads, lining, steering box, transmission, rear-end..."
7. 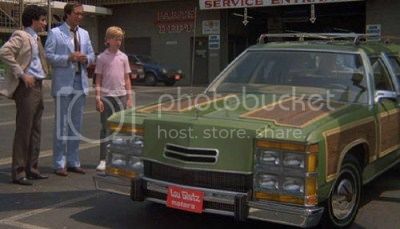 Wagon Queen Family Truckster from National Lampoon's Vacation (1983) - What better way to travel cross-country from Illinois to California? Can't you hear Lindsey Buckingham singing "Holiday Road" now? This car was designed by none other than George Barris whose previous work included the Batmobile from the original 60s series as well as the family vehicles for The Munsters and The Beverly Hillbillies among others. It was based on a Ford LTD Country Squire station wagon which was deliberately modified in bad taste highlighted overdone woodgrain paneling among other unfortunate features. It is also worth mentioning the red Ferrari 308 GTS driven by the tempting Christie Brinkley. 6. 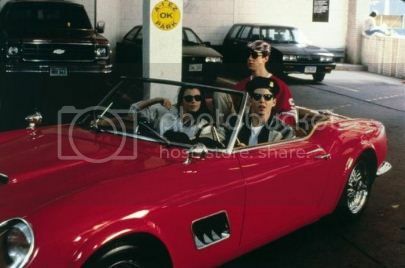 Cameron's Dad's 1961 Ferrari 250 GT California from Ferris Bueller's Day Off (1986) - As Ferris says, "It is so choice. If you have the means, I highly recommend picking one up." It is not just the car, but what the car represents. Cameron says, "Ferris, my father loves this car more than life itself." To which Ferris responds, "A man with priorities so far out of whack doesn't deserve such a fine automobile." When the car is wrecked it forces Cameron to confront his father and deal with his feelings. "If you had access to a car like this, would you take it back right away? Neither would I." 5. 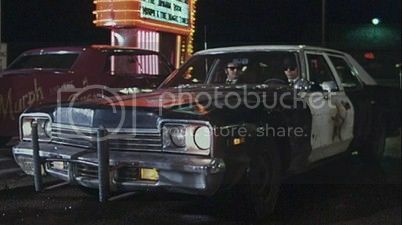 "The Bluesmobile" from The Blues Brothers (1980) - It is a 1974 Dodge Monaco police car and, according to Elwood, "It's got a cop motor, a 440-cubic-inch plant. It's got cop tires, cop suspension, cop shocks. It's a model made before catalytic converters so it'll run good on regular gas." They strap a giant speaker on the top to help publicize their upcoming show at the Palace Hotel Ballroom. It helps them escape in a great chase scene driving through an actual shopping mall and even accomplishes a backwards flip in midair, a jump over an open drawbridge as well as flying over an incomplete bridge under construction. They were on a "mission from God" after all. 4. 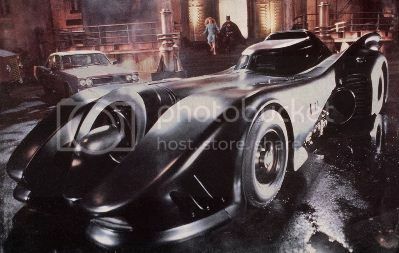 The Batmobile from Batman (1989) - Tim Burton launched the Batman franchise again and with it came a new version on the Batmobile. It continued to evolve in future film versions; and there aren't too many vehicles more iconic than the Batmobile. I always loved the Batmobile from the 60s TV series, but the new version was even sleeker and much more technologically advanced. 3. The DeLorean from Back to the Future (1985) - "Are you telling me that you built a time machine... out of a DeLorean?" 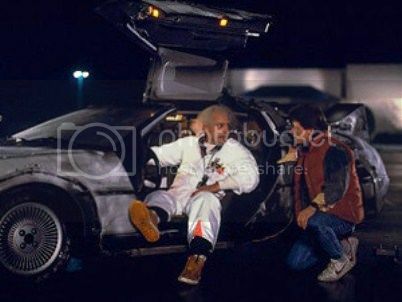 Thanks to the Flux Capacitor and some plutonium (or later Mr. Fusion), Doc Brown was able to create the first time machine out of the unique-looking DeLorean DMC-12 which had ceased its limited production in 1982. The car did have a futuristic look to it especially with its distinctive gullwing doors. It went on to be featured in all three parts of the Back to the Future trilogy and is an immediately recognizable pop culture icon from the 80s. "Roads? Where we're going, we don't need roads." 2. 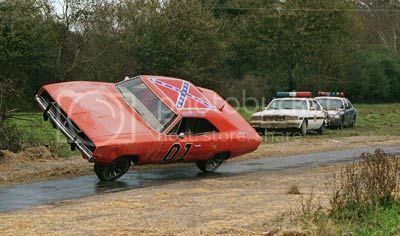 "General Lee" from The Dukes of Hazzard (1979-1985) - As discussed in my interview with the show's creator Gy Waldron, "General Lee" became a character on the show almost as (or more) important and popular as any of the human characters. It was a 1969 Dodge Charger painted orange with a Confederate flag on the roof and the number 01 on the door. The doors were welded shut requiring Bo and Luke to climb in and out through the windows which seemed cool. The horn played the melody from the first line of the song "Dixie" (which coincidentally was the name of Daisy's jeep) and was usually followed by the boys yelling out a "Yee Haw!" 1. 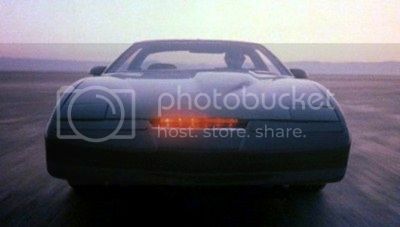 "KITT" from Knight Rider (1982-1986) - KITT stands for Knight Industries Two Thousand and was a customized 1982 Pontiac Trans-Am sports model. KITT was an actual character with artificial intelligence and the ability to think, learn, interact and even vocally communicate. With his voice provided by an uncredited William Daniels, KITT even had a sense of humor and dry wit. KITT had countless cool gadgets and features as well as the distinctive red light scan bar on its front. If I could have any car from the 80s, the iconic KITT would probably be it. There's my list. As usual, these are based on my personal preferences and the order could very well change a little depending on my mood or nostalgia on a given day. Are there any cars or trucks from 80s movies or TV that you feel I have overlooked? If so or if you'd rank any differently, please leave them in the comments section on our regular site and here Retro-Daze as well. Most of these films or shows wouldn't be the same without these memorable and often iconic vehicles. As you can see from this list, cars are not always just props or modes of transportation in television and film. They can tell us a lot about a character or even become a character itself. And the 80s gave us some pretty cool rides, too, to say the least. @lissaschmucker Thanks so much for reading and very happy you enjoyed it. This is one of my favorites. The only car on this list that I ever built a model of was the General Lee. @raptor - Agreed. I felt like I ranked it a little high, but I loved that car as a kid so it was affected by those sentimental reasons. I had the Matchbox car and even built a model of it. The more I look at it, the more I really am loving the Coyote X. Just an amazing looking 80's car that is! 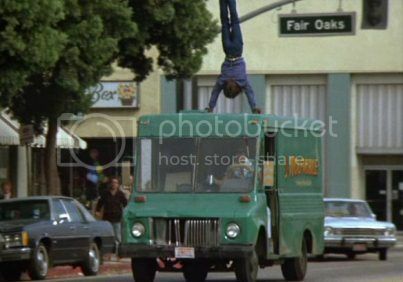 I remember so badly wishing I had the car from Karate Kid. I really liked the old curvy 50s and 60s cars and wished I had one. I liked seeing all of these, good job. Great piece. I did a series on RetroJunk about retro rides. This was a wicked list! Must be nice to have a vehicle from one of these properties (like the guy with the Better Off Dead Camaro). I'd like to own something like that. This was so much fun to read. Excellent man. Man I can recall every single one of these cars and trucks. Yeah, I might change a few around here and there but this was a really COMPLETE list and has something for everybody. I had read your last blog post and it was a good interview. I didnt know the guy but it must be nice to leave a legacy like he is leaving. Such a great list! I think you have done a remarkable job capturing the whole range of styles of classic 80's vehicles. I love that you inlcuded the burnt up station wagon from "Planes, Trains, and Automobiles" and Lane Myer's Camaro. I would only add 3 to this list, probably only as honorable mentions; "Rubber Duck's" Mack from "Convoy", the ghostly diesel truck from "Duel", and the tank from... well... "Tank". Thank so much Old School for presenting this list to us. Such a great read! And for those who have not already, I recommend you stop by his blog as linked to in the article. There is SO much good retro stuff there to chew on!